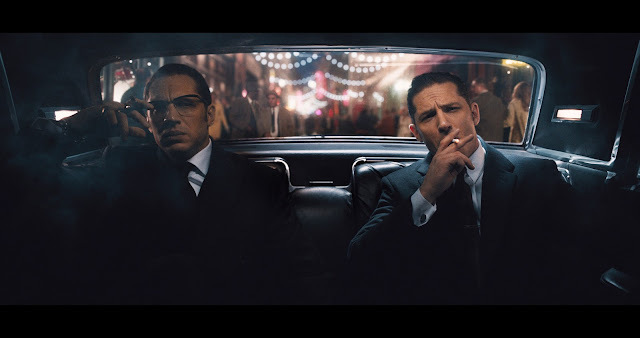 At one point in Legend, the tale of the notorious East End gangster twins, Ronnie and Reggie Kray, Ronnie says “You shouldn’t hide who you are. It makes you sad”. The man has a point. It’s a good mantra for accepting yourself as you are but when you’re a psychotic thug with delusions of grandeur that makes you a dangerous man to be around. Ronnie Kray was a powder keg of violence just waiting to explode and he and his brother Reggie, with his matinee idol looks and pummelling boxer fists, blazed a trail of terror through the East End of 1960’s London. Tom Hardy, playing both brothers, gives an astonishing double performance. He plays Reggie with a suave James Bond like charm, an ordinary decent criminal with a spring in his step just trying to make a nice life for himself. Ronnie on the other hand seethes violence talking in a low voice through his bottom teeth, his body rigid, his heavily medicated eyes peering out behind his spectacles. 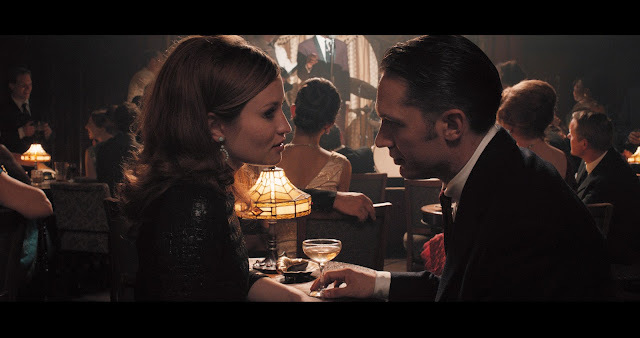 Unfortunately for Hardy though there’s a flaw in the narrative, in that they are seen through the eyes of Reggie’s wife Frances (played by Emily Browning). She narrates her story within the chasm of theirs with a result that we don’t get the full focus we seek on the two brothers, instead we are drawn into her blossoming romance and then stormy marriage with Reggie. This is all handled well but given you have someone with Tom Hardy’s ferocious intensity in those two keys roles, it seems wasteful to not let the twins have full focus. Their gang of crooks and henchmen are also not fleshed out enough and it would have been nice to see more of the crew dynamic and their ongoing game of cat and mouse with Scotland Yard. Christopher Eccleston as ‘Nipper’ Read, the detective who was constantly on their tail is introduced at the beginning and then set aside for a large part of the film, losing that momentum. Brimming with violence, the Krays story is a fascinating one that doesn’t shy away from their fury (literally hammering a gang while they wait on their Guinness to settle), but it suffers from being too light on the actual exploits of being a gangster and how they achieved what they did. The introduction of the American mafia in the form of Chazz Palminteri is a welcome one, but again it feels side-lined in favour of Reggie and Frances story. Director Brian Helgeland (Payback), who co-wrote the screenplay with John Pearson (based on his book The Profession of Violence) brings a cartoonish cool look with swinging 60’s styling while the narration stirs memories of Scorsese's Goodfellas, if falling short of its very high gangster benchmark. As Frances, Emily Browning is more than a match for Hardy and like the lemon sherbets Reggie buys to woo her, she is strong on the outside but fragile when broken, her life soured by the Kray experience. There are impressive supporting turns also from David Thewlis as their business advisor Leslie Payne and Taron Egerton brings charisma as Teddy Smith, Reggie’s lover and sidekick. Legend is perhaps not quite the gangster film you might hope for but Hardy puts in two towering performances, making it worth a look.